Due to the existing postholder leaving the Trust an exciting opportunity has arisen for an internal candidate to be seconded into the Ward 23 Ward Manager role for an initial 6 month period. This is a demanding role that requires commitment and a positive approach towards change and it is vital that you demonstrate the Trust values throughout your work. 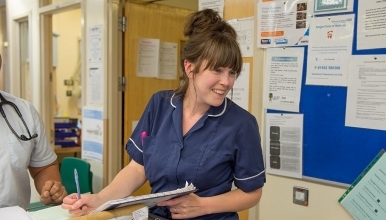 We are looking for an enthusiastic, hardworking, motivated and committed individual to lead and manage the joint Oncology & Haematology inpatient ward. The successful candidate will lead the team of nurses providing vital support and specialised services and will work with all staff to ensure this ward runs smoothly and effectively. You will need to demonstrate strong leadership and management skills and have excellent communication skills with people at all levels. You will also need to have high clinical standards and a passion to make a difference for patients and staff alike. You must have a minimum of 2 years experience at Band 6 in Oncology/ Haematology and have completed the external chemotherapy course. An Oncology or Haematology specific course and mentorship would be an advantage but not essential. We will be happy to support the successful candidate with additional management training.